Softricity was the pioneer with application virtualization. Microsoft did a great acquisition in January 2007 by buying this company. After one and half year the new 4.5 version is the first version which is branded to Microsoft. The name SoftGrid is almost disappeared and replaced by App-V 4.5 (or Microsoft Application Virtualization, which was initially the new name for the product). In previous version it was not really easy to preload applications on the SoftGrid client, because a user needed to be logged in. In App-V 4.5 this is now possible to arrange that without any users logged on. Unfortunate this only functions in combination with Microsoft SMS. One of the major complaints of the SoftGrid infrastructure was the back-end overhead including a management server, Active Directory assignments and a database. With App-V 4.5 there is now also a lightweight server available without those components. There is now also a possibility to use the virtualized applications without a server, but logically you don't have the streaming and active upgrades option. 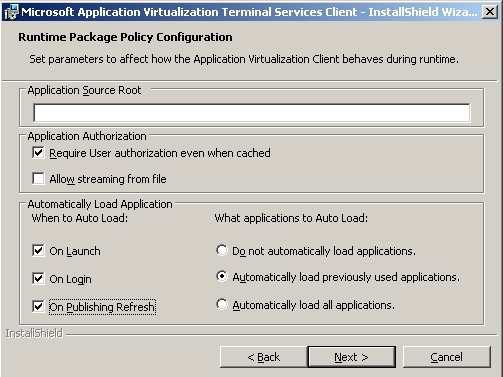 The auto caching option allows background streaming of virtualized applications (even when the application is not in use) without disrupting the work of the end-user. You can configure the behavior of the auto caching on the client. The configuration of the client has several improvements. A great improvement is the possibility to overwrite the SFT location specified in the OSD file to another location (very useful if you have different locations with a local App-V server). Also the client settings can now be management by using the App-V ADM Template within Active Director Group Policy Objects. This feature is probably the most important feature to upgrade your current App-V infrastructure. The concept of separating each application in a separate "bubble" solves many compatibility issues, but the middleware applications still were needed in several "bubbles". This caused that updating such a much used middleware still needed much work. With Dynamic Suite composition you can create a separate sequence for the middleware application and assign that to another application. Really wonderful option and my current experiences are pretty OK with this feature. Although the protocol used is a relative good protocol using HTTP Streaming according to Microsoft will providing dramatic performance and scalability improvements. The sequence process is simplified by hiding and removing advanced features which were never touched by any sequencer. With this feature virtual applications can be easily deployed with any existing infrastructure that uses MSI deployment (most useful when using the App-V Lightweight Server or Stand Alone option). App-V 4.5 can be seamless integrated with System Center Configuration Manager. For a full list and more information about the new features this webpage is a very good starting point. Now we have seen the new feature let's take a look at the product. Like the previous versions there are three installation procedures: the installation of the App-V server, the App-V client and the App-V Sequencer. Because of the new different server types (full version or streaming) you should carefully consider which type you are going to use, because it are to separated installations. When choosing the full version you also need to decide where you are going to install the components. Like previous version there is a web service for administrating the App-V environment which needs IIS and .Net Framework 2.0. This can be installed separately or combined with the Streaming component. The installation is pretty similar as the previous versions. 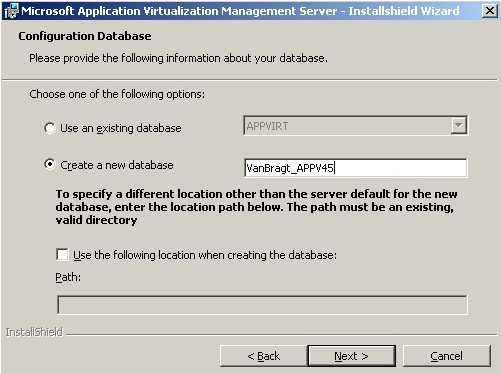 You need to specify the database server (a new database can be created within the wizard now), a certificate can be selected (if you would like to use secured streaming), the streaming port and the groups authorized to use App-V and to administrator the App-V infrastructure. The client installation is changed a bit, because one of the new features to override the SFT location specified in the OSD (see Figure 2). Other installation steps are specifying the locations for the Global Data and user Data, the App-V Drive, the Cache size, the automatic load options (also a new option) and at last the type and name of the App-V server. The sequencer installation is really a step by step installation with only one parameter to specify the installation location of the program. Configuration for the App-V infrastructure can be performed both on Server as the client. The server configuration is done via the Application Virtualization Management Console. This console contacts the installed web service providing the administration features. Out of this console you can configure some specific App-V settings like memory application, block sizes, number of core processes and similar. From the same console you import the virtualized application into the database, manage the file type associations, authentication settings, refresh settings, managing the administrator role and so on. Remember that his part only applies to the App-V Full infrastructure. When using the Streaming only option you don't have the database and these settings cannot be configured. Also on the client several settings can be configured. Logically the App-V Streaming Server can be configured and more specific settings can be configured. In this App-V 4.5 version Microsoft is providing an ADM template to configure all clients centrally using a Group Policy Object. This is a wonderful solution, especially when you have several locations with several App-V infrastructures. It is a pity that now all options are available in the ADM template like the configuration of the cache size. But there are additional ADM templates released by third parties with such configurable options. The most important part of the App-V infrastructure is logically creating the virtualized applications with the App-V Sequencer. Technically there are not many differences in comparison with the earlier versions of the Sequencers. The biggest change is the simplification of the Sequence wizard. In the wizard lots of configuration options are removed or moved after advanced buttons. This makes the process easier. As mentioned before at the new features Dynamic Suite Composition (DSC) is now available. With DSC it is possible to link sequences in another sequence so those sequences can be used out of the sequence they are linked in. Very useful for middleware applications like Java Runtimes, Oracle Client, Crystal Reports and so on. Linking is based on entries within the OSD file. Unfortunate there is no mechanism to manage the linking out of the management console centrally, but out of the sequencer (or manually editing the OSD files). Therefore you should administrator which sequence is linked in which sequence, especially because the link is based on the SFT file and the corresponding GUID (so a change in the middleware sequence implies changing the OSD in which that sequence is linked). It will go way into detail to mention all the steps. I'm preparing an article for another website about this topic, so check the news section of this website regularly so you are notified when this article is available. After adding the sequence to the management console (or copying the sequence to the content share in the streaming only feature) it is possible to use the application using the Client. With the full version you can configure shortcuts to the application to the desktop or start menu. In the lightweight mode you should arrange the placement of shortcuts to the end user. If you have worked with previous version of SoftGrid on the client side you will see no big differences. The console still looks the same and also from user perspective the look and feel is the same. Under the hood, ad configured in your settings, the application will be cached on the client without disrupting the end-user independent of the user is actually using that part of the applications (as in previous version only the used components were cached). App-V can now be integrated with System Centre Configuration Manager so most of the management tasks and logging can now also be done out of that product. When you compare the App-V as a standalone application against the previous version the functionality is comparable. The report functionality is still available in the management console to create both graphical and textual survey for the following subjects: Application Utilization, System Utilization, System Audit and System errors. When troubleshooting App-V issues there are two log files, which are very useful. On the server side there is the file sft-server.log, while on the client sftlog.txt is available. This sftlog.txt file is your starting point when troubleshooting issues. Microsoft is still using those number error codes, while those codes are still not all available within the knowledgebase. There is still some work to do, because some of those numbers and also the corresponding text do not point you to the right direction. This App-V version includes a lot of new features which many of them are desired. The Dynamic Suite Composition (DSC) and the App-V Streaming only Server are features that for many companies can be a good reason to upgrade to this new version. Of course there is still space for improvements mainly based on troubleshooting (error codes not available in the knowledgebase) and manageability (overview of the connected sequence).